The glaze captures the imagination . . .
Russel Wright dedicated long hours to mixing glazes to achieve the depth of soft color of American Modern Dinnerware. The first glaze colors – Chartreuse, Seafoam, Granite Gray, Coral, and Bean Brown – were envisaged as a complementary palette. The glazes bring out the best in each other – a reflection of color in the natural world. In that vein, American Modern was introduced as “open stock” dinnerware. Seafoam has an earthiness unexpected in blue . . . it is not a blue-gray. A stormy sea at sundown? 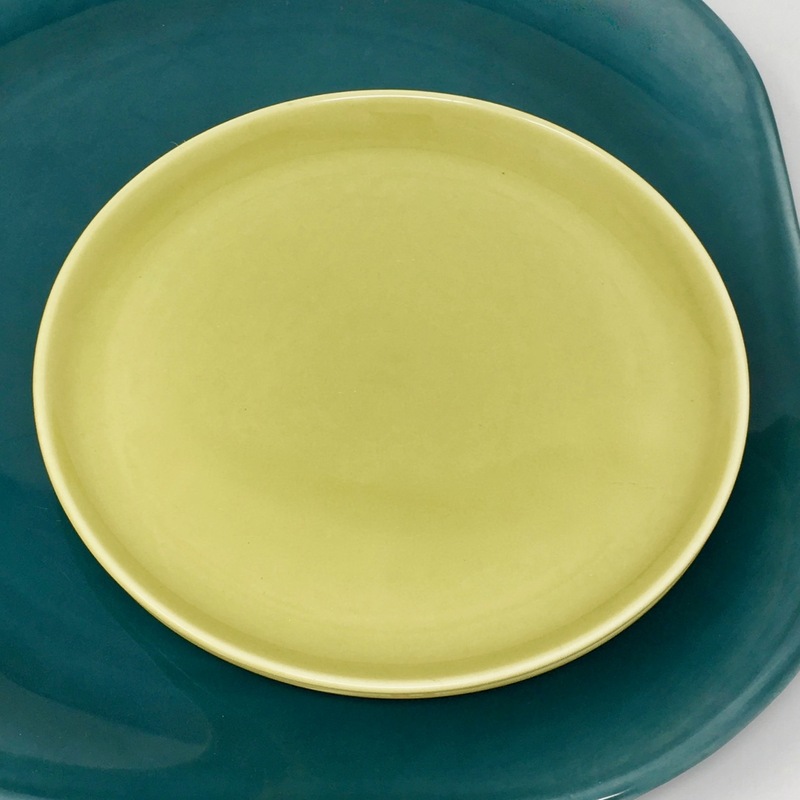 The seafoam glaze grounds chartreuse while the shape of the square platter cradles the salad plate. A platter without a distinct rim or a deep well was distinctly different in 1937. Russel Wright stripped the typical elements of a platter. His minimalist design would shape modern dinnerware while his glaze colors were imitated but never duplicated. American Modern Chop Plate serves as a Cocktail Tray. Good design does not dictate. The chop plate designed for the service of a meat course was a large square platter that might serve as a tray . .. in other rooms as well.
. . . the art of life is centered on the dinner table. The Victorian etiquette books were heavy with standards that were unattainable for most consumers. There were bone plates, fish plates, underplates in the list. And of course, there was the time required to set such a table and maintain a lifestyle dictated by the past that was no longer practical in the every day of life. American Modern set a new standard – multi-functional and undecorated pieces that could be mixed by the homemaker at will. In their book, Russel and Mary Wright wrote, that each table setting would be a unique design – a work of art created by the homemaker. The art of the table. American Modern by Russel Wright. Steubenville Pottery, 1939. Celery Tray, Seafoam (13 X 3 inches). They do not make cards like this anymore. . . they are utterly beguiling in simplicity and color. Simple graphics in this Art Deco Era card are extraordinary – and the typography is striking. The message, Merry Christmas and Happy New Year, comes to life. Governor James Rhodes brought the dream of the Appalachian Highway to life with a lot of political capital earned over the span of a long political career. Born and raised in Southern Ohio, his efforts on behalf of the people and the economy of Appalachian Ohio are still remembered. Jimmy, as the old timers call him, is a local hero. On its long, empty stretches, the James A. Rhodes Appalachian Highway gives drivers green vistas of southern Ohio’s rolling hills. This is not the green that planners had in mind. The need for connecting roads was felt long before Governor Rhodes. H. R. Wylie, the owner of the pottery in Huntington, was very active in politics on the West Virginia side of the Ohio River. Mr. Wylie lobbied for support, invested a great deal of money to effect change and even entertained the idea of running for state office. Roads were essential for commerce – which as every school boy knows is good for the people. A Railroad Tunnel Built in the Late 19th Century, Moonville, Ohio. This picnic basket is supported with an oak frame and split oak base; double-wooden handle and brass tacks and hinges. The woven wicker top is supported by fiber board. Notice the diamond accent also woven in wicker. This basket is a real beauty. Call it what you will . . . Retro Diner, Restaurant China or Restaurant Ware. To my eye, these plates look fresh and modern. Black is back but did it ever fade away? The scalloped edge brings a cottage in the country feel. The bold black thick border looks clean and contemporary. Add to a collection or start a collection with these pieces. They will be with you a long, long time. Adding a few photographs so that you can see them all together and on their own. Hard to choose a favorite when I favor them all . . . The best thing about a hat – put a hat on your head and you can become a different person. Or the same person with a different attitude. Especially with a vintage hat. Recently, we inherited quite a few fascinators. “A what,” you might say, well I hope a few of you might say since I was perplexed. What is a fascinator? According to Google, “a woman’s light, decorative headpiece consisting of feathers, flowers, beads, etc., attached to a comb or hair clip.” A fascinator might look like this . . . Sometimes I “meet” people on Etsy who speak to me far beyond their email or convo in Etsy speak. In fact, I think that I have been so lucky to meet so many kind and generous people on Etsy. But one day, I discovered that a pair of gloves was going to be worn at a wedding. Imagine that . . . a wedding in Texas. A pair of sheer pink gloves that are much like the pair pictured in this advertisement. “Let’s have a picnic.” Yes! Gather the supplies and pack the food. The adventure really begins once we are all in the car. We must find the “perfect” picnic spot. At first, we pass places that are not shady enough, parks with too many people or for one reason or other they are “not quite right.” As time passes and the sun wanes, boredom sets in and hunger prevails, not-so-perfect picnic spots look so much better – even you might say, perfect. My favorite book describing the hunt for a perfect picnic spot is “The Bears Picnic” by the Berenstain Brothers. Even though it has been a long long time since I have read it to a child, whenever I think about picnics, I think about the bears’ picnic. I enjoyed reading another take on this book at Write Run Repeat. The perfect spot, of course, is very close – no need to travel at all – a backyard picnic is a joyful idea. I often wonder about the new homes for the vintage treasures that we send. Taryn paired a 1950s mirrored filigree vanity tray with painted ball jars and then added a glass knob. . . . what a great new look for a vintage tray. Vintage Filigree Mirrored Tray with Vanity Jars. 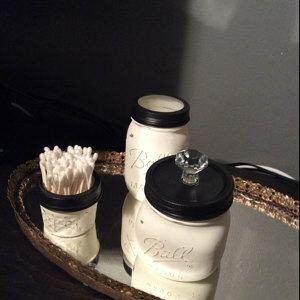 Ball Jars painted white – Voila! New use for Ball Jars. Time to celebrate . . who doesn’t love to give? We’re giving this beautiful Guatemalan tote bag to one lucky person. We will select one name randomly on Saturday, August 22. Just leave a comment on our Facebook Page – what do you like best about this bag? All that is needed to understand the beauty of ergonomics is to hold the salt and pepper shakers designed by Russel Wright for Steubenville in your hands . . . to hold them is to love them. They fit the hand so perfectly. And we would like to give you that opportunity. We are giving away this set of chartreuse Russel Wright Salt and Pepper Shakers. The ink was barely dry on his master’s thesis when John Gilkes accepted the position of Lead Designer for the Taylor, Smith Taylor Pottery. Gilkes, under the tutelage of Arthur E. Baggs, the renown potter and professor of ceramics at Ohio State University, researched production techniques for new dinnerware shapes. Innovation was paramount to the potteries that had enjoyed success along the banks of the Ohio River. Especially in light of the heightened competition from the Asian marketplaces and the new attraction of plastics to homemakers.